There were messages on boot "acpi bios error (bug) \_sb.pcio._..." that I ignored assuming it's an outdated bios or something..., a slower boot (compared d610 laptop), but system was fine once booted. Testing had issues only with falkon. On opening via menu, it would close. I ran it from terminal, then got messages. I shutdown system, walked thumb-drive back to d610 & no issues with falkon. Then opened `falkon` from terminal. On selecting the "Bloomberg Live" stream, the window draws normally, then crash back to terminal. I `ubuntu-bug` reported on dx6120, but on opening browser to submit; crash again (paste following this) I suspect because falkon would try & continue... The Qterminal messages were saved (featherpad), & `scp` to this box where I'm completing this. I got the error multiple times, multiple boots; different youtube videos - but I only tried youtube. Error creating database schema "No query Unable to fetch row"
Xlib: sequence lost (0x105a1 > 0x5a5) in reply type 0x0! application. This might take a few minutes. *** Send problem report to the developers? The collected information is being sent to the bug tracking system. You can launch a browser now, or copy this URL into a browser on another computer. Xlib: sequence lost (0x105d5 > 0x5d7) in reply type 0x0! falkon: ../../nouveau/pushbuf.c:233: pushbuf_krel: Assertion `pkref' failed. different web sites - yes & no. I've gone to launchpad.net many times without issue, looked up wiki & google searches too without issue, and actually forgotten about this bug to be honest. Booted hp dx6120mt (mini-tower, pentium 4 dual core, 3gb, nvidia 7600gt) using 2018-10-03 daily-x86-iso and it was fine going to launchpad.net, google, and many sites. However I went to youtube, it showed the first screen then locked up. (no reports) then crashed. I tried plus.google.com, freeze then crash back to qterminal. 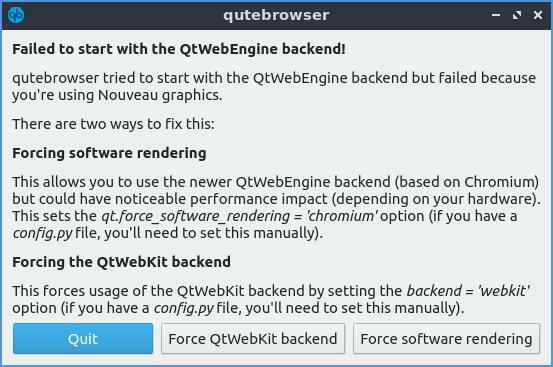 I installed qutebrowser; -- it started showing the message on attached screenshot; I selected software-rendering it performed equal to Falkon. (fine on sites falkon was good with, but painful where falkon was painful). It spat out TONS of messages to qterminal during its operation ; eventually Seg fault (core dump). 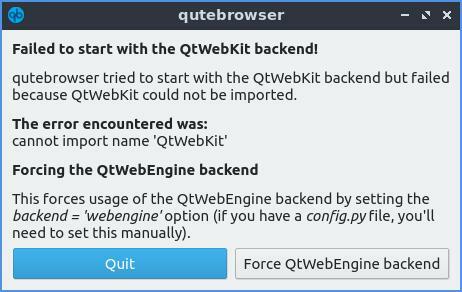 I haven't yet tried the other options - i re-opened qutebrowser hoping to get question again, no it tried to continue & coredump. (doing ubuntu-bug of one of those crashes now; I'll deal with that, try and link it too here & aim to return to see if I can provide more..
notes: installed (& updated) system is no different to when used live. Box now has 3gb of ram. The 1796034 bug states "The information on this page is private"
I re-started qutebrowser - it went to plus.google.com okay, until I selected to start a video, then the endless messages start flooding... (the endless flood causes stack exhaustion??) ending in segfault (coredump). I've been unsuccessful it switching to my other option in qute; will reboot..
Oct 04 07:09:28 lubuntu whoopsie: [07:09:28] Parsing /var/crash/_usr_bin_qutebrowser.999.crash. Oct 04 07:09:28 lubuntu whoopsie: [07:09:28] Uploading /var/crash/_usr_bin_qutebrowser.999.crash. the proprietary drivers I think are a no go, nvidia-driver-304 are unsupported in 18.04 up.